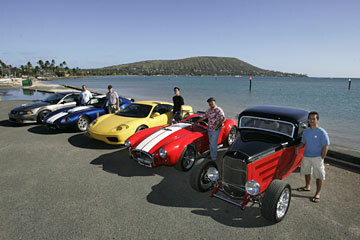 Cars going on display in the Hawaii Big Boy's Show next weekend at Blaisdell include, from left, Larry Manuel's '32 Coupe 3 Window Hi-Boy, Rod Baybayan's GS Shelby Cobra Roadster, Eric Yee's 360 Modena Ferrari, Alan Zane's '65 Shelby Daytona Coupe and Steve Mix's '02 Saleen Mustang. IT'S NO coincidence that the Hawaii Big Boy's Show 2007 is scheduled for the second weekend in February. » 9:15 p.m.: Big Every Time feat. I.A. With the NFL Pro Bowl in town and a certain holiday coming up next week, the three-day exhibition of gear for guys is the perfect opportunity to size up that end-of-season performance bonus or find just the right gift that says "I love you" to the important man in your life. "Valentine's Day is right around the corner," reminds Big Boy's Show associate producer Jas Pascua. "So this is a good opportunity for the girls to come out and see what the guys want." ONE THING guys like is cars, Pascua said. And if there's anything they like more, it would have to be a custom chopper motorcycle. Both will be on display, with a variety of modified rides parked alongside brand new vehicles from JN Automotive. The Oahu Motorsports Council will also have an official NASCAR race car on hand, and the U.S. Army will represent with an exhibit featuring armored Humvee vehicles. More than 75 private vehicles are expected to go on display, according to auto/bike coordinator Rod Baybayan. Approximately two dozen of the cars will be classic hot rods, and he also expects a number of exotic cars and import roadsters. A variety of vendors will display the latest technology and fashion for guys, and NFL players will be in the building all weekend to sign autographs. On Friday, Pro Bowl players Derrick Burgess, Antonio Gates, Marvin Harrison, Devin Hester and Larry Johnson will be available for fans starting at 7 p.m. Former University of Hawaii quarterback Timmy Chang will sign on Saturday night at 7 p.m. 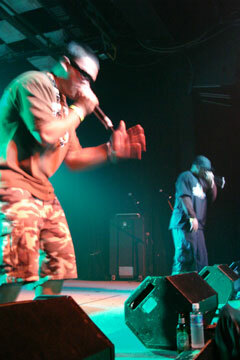 There also will be entertainment, including a show featuring I.A. on Saturday. Sunday's featured players include NFL Hall of Famers Marcus Allen, Warren Moon and Thurman Thomas, and current players Drew Brees, Frank Gore and Steven Jackson. Former University of Hawaii punter Mat McBriar also will be in attendance. And what's a guy's night out without a poker game? Local radio stations have been giving away seats to a special tournament that will take place at the Big Boy's Show, with the winner scoring a trip to play in a World Poker Tour event in Commerce City, Calif.